Google Chromecast review | What Hi-Fi? TV on a stick! That’s what Google promised with the Chromecast. And while it has made waves in the US in the past year, it is fairly new to UK shores. The first thing you need to know is that this is not a streamer in the traditional sense. You do not boot it up and choose from a content menu. Instead, you ‘cast’. Casting is Google’s funky new way of streaming, built around the notion that most people have wi-fi at home and smartphones in hand. You begin with a mobile app. Find content you like, tap the ‘cast’ button, and it pings up on your TV. You don’t actually send anything directly from your phone (or tablet) to the screen. It conspires with the Chromecast over your wi-fi network. The phone merely acts as a remote control, while the Chromecast plucks content directly from the Internet. The idea is to do away with boxes under the TV, along with the fight for the remote. Just find what you like on your phone, and push it to the big screen. Easy. If there is a catch, it is the matter of compatibility: not all apps can cast. 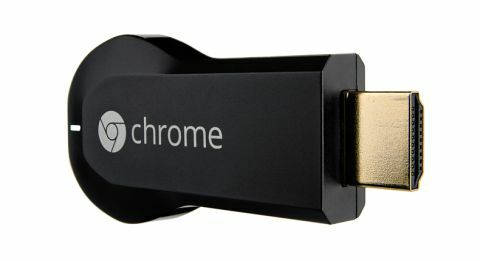 Chromecast was launched with just Netflix, YouTube and Google Play in mind. Thankfully, Google has an open approach, and more are springing-up all the time. Now there is a long list, which includes Now TV, Blinkbox, BT Sport and BBC iPlayer. There’s no sign of 4oD, ITV Player or Amazon Instant Video yet, but already the Chromecast offers more choice than the Apple TV. The Chromecast is also hospitable. It doesn’t seem to care whether you use Android or iOS. We managed to control it using both an LG G3 and an iPhone 5 with similar levels of performance. Another trick is the ability to cast webpages. Download a free extension on the Chrome browser and you’ll be able to mirror individual tabs on your TV. This feature is still officially in beta testing, however – dropouts are not unusual. The device outputs a crisp, stable picture that goes up to 1080p. It’s also capable of Dolby Digital Plus 5.1 sound. Overall, Chromecast works very well. Casting may seem an odd idea, but it feels perfectly natural – not to mention cool. Ideally, you’ll want a good wi-fi connection. This ensures quality of performance, but also lets your phone or tablet maintain control. If your broadband is a bit sketchy, you’ll be treated to adaptive streaming. Picture quality will adjust itself, downscaling to keep moving and avoid buffering. The real wonder is how Google has crammed it all into a device barely larger than a memory stick. The sole output is an HDMI plug. Power comes by a bundled USB cable, and if you don’t have a spare port in your TV you can use the adaptor. We really like the Google Chromecast. It’s a novel idea that works very well, and only promises to get better as developer support increases. For £30 – or even less online – you cannot go wrong.